The third and final solar eclipse of 2018 is just around the corner and is set to be the most-watched eclipse of the year. It will take place on Saturday, August 11. Unlike the total lunar eclipse on July 27, this week’s event is a partial eclipse – meaning the sun will not be completely covered by the moon. The eclipse with be visible across the northern hemisphere, with the best view stretching over Siberia and far-northeastern Canada. Those in northern Scandinavia, Svalbard in Norway, most of Russia, Greenland, northern China, Mongolia, Kazakhstan and Kyrgyzstan will also get a great view of the crescent sun. Viewers can catch their first glimpse of the eclipse at about 8am UTC on Saturday, with the peak at about 9:45 am. It will fade at 11:30am, according to Time and Date. 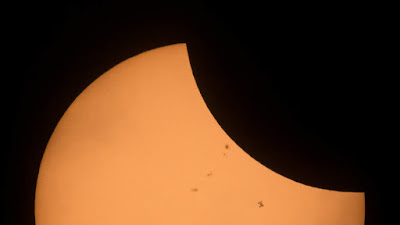 But what makes this event special is that it will be seen by more people (25 percent occultation) than any of the others – the previous eclipses saw 10 and 16 percent occultation. As the sun will never be completely covered, spectators are advised to wear solar safety glasses at all times and photographic equipment will need filters. The next partial solar eclipse is scheduled to occur on January 6, 2019, in the north Pacific and northeastern Asia.